Bulky wallets and cash are out while digital credit cards are in. Given the continuous innovation and change, life in itself becomes hassle-free, convenient and most importantly, simplified. With close to 2.5 billion smartphone users worldwide, it only took a few years before credit card holders began making purchases by simply tapping their phone on the point-of-sale machine. 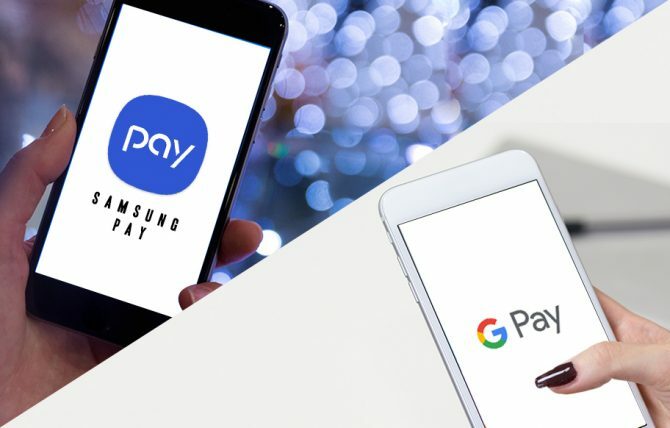 Google Pay and Samsung Pay are two revolutionary digital wallet technologies that allow you to make every transaction with a single tap. These are security-protected and don’t add extra clutter to your bag, wallet or pocket. Your credit card information is stored in your smartphone and you can carry it with you anywhere you go. Because Google Pay, formerly known as Android Pay, is supported in 71 countries, it is better than Samsung Pay when it comes to availability. Samsung Pay is only available in 25 countries, mainly in Asia. Furthermore, Samsung Pay is only compatible with Samsung phones, unlike Google Pay, which is compatible with all Android phones. Google Pay uses NFC technology while Samsung Pay uses this and Magnetic Secure Transmissions (MST), which mimics the magnetic strip on a credit card. There is only a slight difference but Samsung Pay works better as you can use it at any payment terminal, even those that do not accept contactless payments. Google Pay lets a user save all their card information, including Visa supported cards, loyalty, memberships, rewards cards, gift cards, passes, tickets and more. It can also help send and receive money within the mobile app. Samsung Pay, on the other hand, lets users earn points from their Samsung Rewards system but other than that, there’s not much else you can do. Both technologies have integrated tokenization to help secure the actual card number on the credit card. Since fraud is rampant these days, having a temporary credit card number gives a user an extra layer of security when paying online. A one-time OTP is also sent to the mobile phone before proceeding with a transaction. In addition, a PIN or fingerprint scanning can be set up to protect the mobile app from being accessed, so every time the user opens the app, entering a PIN is required. The only notable difference between the two is that Samsung Pay offers a free service to remotely lock or erase the app within the mobile device. This can be done if the phone is stolen or lost. Verdict: Google Pay or Samsung Pay? Overall, there’s not a lot of difference between the two digital wallet apps, but we would consider Samsung Pay first for the extra layer of protection and assurance if the device is lost or stolen. Although the app only supports Samsung phones, you can rest easy knowing that your money is safe and intact. If it’s availability, compatibility and extra features you are looking for, Google Pay is the digital wallet for you.